before I put henna on my own newborns. to repel the harm of evil eyes. our choicest meats and purest waters. sparing no exertion for my diversion’s sake. in the chill of winter's longest nights. with a tongue toothed like the surface of a file. wheedling with her little high-pitched moans. a sight that gives the eyes no pleasure. in batting him awake with a left and a right. swoops like a falcon when he tries to creep away. those hopes are dashed with a serpent’s liveliness. he takes the cup of destiny from a server. *Qur'an 2:90, 3:178, 4:14 et passim. It has struck my ear from the mouths of those who were at Khwarazm, and from the tongues of those who were passing through, that our master - may God perpetuate his superiority over all who lack his richness of soul, and over the officers who give him counsel - invited a gathering of men to revile me, impelling them to extravagance in their censure and abuse, and that he was deliberate in tearing aside the veiling curtains of gentility, on the charge that my library was wrongly acquired. Does this seem worthy of his merits and his virtue? Is it congruent with his nobility and and gentlemanly character? I am vexed by his dishonesty and injurious slander, which is a calumny against his Muslim brother. By God, when the horn is sounded on the Day of Resurrection, and these worn-out bones are resurrected from their tombs, armored in the clothes of the life to come, and the worshipers of God are gathered in the open spaces, and the record of every deed flies in the face of its doer, and every soul is asked about its acquisitions - on that day, the evildoer will be dragged face-down to the Fire, and the good-doer will be escorted to Paradise at the side of angels. On that frightening occasion, no one will be tugging at the tail of my cloak, asking for the return of any properties which I appropriated, or any wealth I took by force, or any blood that I shed, or any curtain I have torn, or any person I have killed, or any right that I have trampled on. With God's help, I have acquired some 1,000 manuscript volumes of crucial texts and vital writings, and endowed them all to libraries whose construction was ordered by God for the benefit of Muslims in all the countries of Islam. How does a fellow believer allow himself to envy the books of one of knowledge's foremost teachers, who has striven his whole life to obtain some modest papers, when their market value is unequal to the cost of a single feast? By God beside Whom there is no god, I swear that our master - may God perpetuate his superiority – has committed a false calumny against the likes of me, and done a wrong which will tangle his train and cause him to stumble on the Day of Resurrection. Let him fear God, beside Whom there is no god, and let him remember the Day on which the truthful will be repaid for their truthfulness and liars will be punished for their lies, wa-salām. "Bookmen" [al-kutubiyun] were those who specialized in the sale of books, some of whom also did their own copying by hand. Among those who gained fame in this type of work were Jamal al-Din ibn Muhammad ibn Ibrahim ibn Yahya, known as al-Watwat ["The Bat"], Muhammad ibn Ahmad al-Dimashqi, and the poet Ibn Sham'un al-Kutubi. In Damascus, Muhammad ibn Shakir al-Darani al-Dimashqi was renowned. And there were many other bookmen of this class. "The bookmen" was used to designate the book market generally without the accompanying word suq. We find this usage in a text describing the events of 279/892 when, on assuming the caliphate, Abu 'l-'Abbas al-Mu'tadid ibn al-Muwaffaq forbade the sale of philosophical texts: "In that year, Abu 'l-'Abbas banned the story-tellers and astrologers, and ordered the bookmen to stop selling works of philosophy and dialectic." With the invention of paper, the markets and shops of stationers and bookmen became conspicuous throughout the Islamic world, and those who practiced the stationer's trade became a prominent class in society. Ibn Khaldun described them as "those who busy themselves with copying and correcting and bookbinding and other matters relating to books," most fundamentally their traffic and sale. Scores of shops began to sell not only books, but the materials necessary for their manufacture, such as paper, ink, and writing implements - the most decisive indicator of the book trade's prevalence. For these had become indispensable to students and the learned alike, who copied what they needed out of books in addition to buying them in great numbers from the stationers' markets. These shops began to spread through the urban centers of Islam, taking hold to the point that some parts of Arab cities became known as "the district of the bookmen" (or "books" or "stationers"). In Baghdad, seat of the 'Abbasid caliphate, stationers' markets appeared all over, but only one was known as "the stationers' district." This was a large area containing a large number of shops specializing in the sale of books - one hundred of them in the vicinity of the Basra Gate alone. Ibn Nadim gives evidence of one such market in his remarks on Ahmad ibn Abi Tahir: "The son of Khorasani parents, he used to sit in the stationers' market in the southeastern part of Baghdad." Another booksellers' district of renown was in the neighborhood of Taq al-Harrani, on the western side of the new bridge. It is mentioned that on the death of Ja'far ibn Ahmad al-Marwazi in 274/888, "his books were taken to Baghdad and sold in Taq al-Harrani." 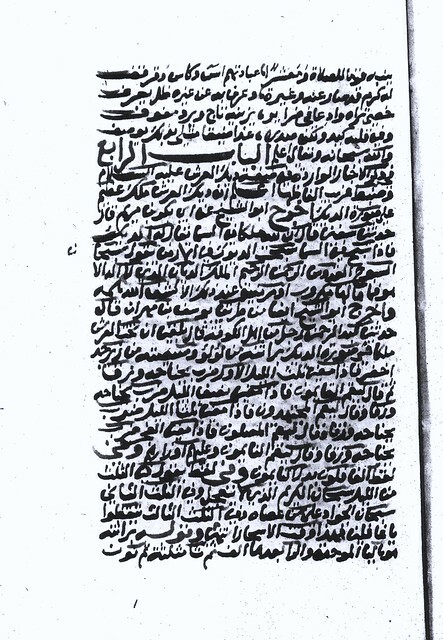 And Abu 'l-Qasim al-Harith ibn 'Ali, a stationer of Baghdad, is said to have sold and copied books for people in the western neighborhood of Qasr Waddah. The stationers and bookmen's markets of Cairo are known from the description of al-Maqrizi: "To the best of my knowledge, the market between El Sagha and the madrasa of al-Malik al-Salih emerged around the year 700/1300, in the neighborhood of the mosque-hospital of al-Mansur Qalawun.... For a time, the book market was moved from this location to a roofed esplanade between the poultry market and the market of the mat-weavers, by the anointed pillar of the Grey Mosque. A number of the district's inhabitants joined in the raising of the roof, but the dampness of their cellars proved detrimental to books and some were ruined. So the market was removed to its current location, which is still a habitual gathering place for scholarly types." "There used to be a book market in Fustat, on the eastern side of the mosque of 'Amr ibn al-'As, next to 'Amr's house in the chandlers' quarter. Its vestiges were still there when I visited in 780/1378, but have since been swept away, and its onetime location is no longer common knowledge." for charity, but my hopes lay in a different direction. like the cast-off, worn-out sole of your shoe. and you are worthy of what's already yours. what else is stupidity, if not that?" 'He attacks and advances without awareness or knowledge. The man said: 'If Your Honor will allow me to approach, I have something to say.' 'You may approach,' said 'Ubayd Allah. "The man said: 'Of all people, it is you who have the most reason to keep quiet about that poem, for you know about whom it was spoken.' 'Ubayd Allah smiled, and said: 'It is evident to me that you are the wronged party in this case. Return to your home.' He then ordered the man's adversary to approach, and said: 'You are to pay him the full amount demanded.' "
You (may you come to know of the good and by the good!) should know what a grave hazard to humankind it is to have ignorant authorities and misleading sources. Having been humankind's affliction from the earliest and most bygone of eras and days, it is much worse in our own time, in which we have wound up at the pinnacle of confusion and the murkiest extreme of turbidity. "Busy in all things, he masters none of them. His guidance increases in nothing but error." What is more, without his pretensions to being the wisest of men, his drivel brings him no pleasure. In reality he is a blight on his students, and to those seeking an education he is poison. In his mind, however, even an assembly of his own preceptors would be in need of his instruction. When he narrates, he prevaricates, and when questioned he vacillates. When disputed he yells, when contradicted he brawls, and when the proof against him is decisive he answers with foul language. "He attacks and advances without awareness or knowledge. "I heard al-Khalil say: 'Some people have knowledge, and know that they have knowledge. These are the learned, who should be followed. Some have knowledge without knowing that they have it; such people go astray, and should be led aright. Some do not have knowledge, and know that they lack it. These are the students, who should be taught. And some have no knowledge, and do not know that they lack it. These are the ignorant, and they should be avoided.' "
whose worship is mischief and liquor and cups. and his rival is never allowed to forget it. as are his bright crown and his striped, fringed vestment. no better way to describe him than this." And God, be He praised and exalted, knows best. Chapter 4: Reports of the attributes of the Rooster of the Throne, peace be upon him, with close attention to the rare words they contain. The Rooster of the Throne is an angel of great magnitude in the form of a rooster. Abu 'l-Shaykh quotes Abu Bakr ibn [Abi] Maryam on the authority of Mughira [that the Prophet said:] "God, be He praised, has an angel in heaven called the Rooster, and when he praises God in heaven the roosters on earth praise Him also. He says: 'Praise be to the Most Holy, the Merciful, Compassionate and Divine King! There is no God but He.' And God will relieve the distress of any sick or troubled person who says the same."